It's actually a site update! Plus, things seem to be working ok with the images hosted at my other site. Which is a good thing. Hopefully people will vote on the domain name poll. Yeah, it's been a while since I posted anything to the news blog. I'm going to have a bit of time to work on updates, mostly because walking is painful. For those who don't know me at other boards, or don't visit the Beast Boy Shrine Message Board, I fell getting off a school bus. Yeah, all my students got a laugh (or a big scare, depending on how close they were to where I fell). In short, I sprained BOTH ankles. Anyhow, I'm going to try to some massive scanning and uploading. I need to check with Gina to see if I can host my images at the forum site. Tripod's running low on space (I'm down to 31mb free) and a good upload will take a chunk of storage. As to Beast Boy and Titans news... the best news is that Gar's history is now intact. For those who don't know about the Doom Patrol reboot, basically someone at DC felt it was a good idea to "reboot" the DP - in short, totally wipe out the team's past, bring back all the old characters, and act like everything old is new again. 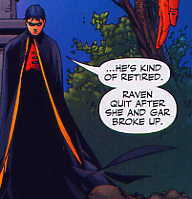 The writer, John Byrne, dubbed Gar "the Donna Troy of this reboot." Considering how screwed up Donna's origins became after Byrne got his claws on her, Beast Boy fans were not happy. Now that Byrne's Patrol failed, Geoff Johns, between Identity Crisis #4 and Teen Titans #32, has basically "awakened" all the memories and Byrne's patrol has been attributed to a time glitch caused by Superboy Prime and Alex Luthor. The important part is that the Doom Patrol now has all their memories of the past, that all previous DPs are "in continuity", and Gar has his adopted family back. Now, the "One Year Later" news is pretty nebulous. We know that Gar's on the cover of Teen Titans #35 in front of a "new Doom Patrol." Who exactly is in this team, and what the new DP's future is still is up in the air. Beast Boy fans (and Doom Patrol fans) are waiting with baited breath. Oh... if you're a Doom Patrol fan, come by Beast Boy Shrine Message Board. We now have a very active Doom Patrol forum - come and learn about the history of the series or talk about the toon version. At long last, I have a round of updates up and posted! Looks like this blog is going to replace the News and Events page... same way the Beast Boy Shrine 3.0 is going to replace the Bravenet forums. This will be easier to update when there's significant news to report. According to Link Alarm, It's Not Easy Being Green has 58 pages, while Mystic Manor has 73. WTF? The annoying thing about this blog... it doesn't have emoticons for everything, such as "tired" - I'm tired... waisted most of the morning with mom. Anyhow, this blog isn't for that - this is for site info. Fangirl Ravings and Mystic Manor are updated... waiting for the report on It's Not Easy Being Green to finish - turns out that in the subdirectories, I had 73 pages in Mystic Manor alone (never realized I had that many, unless it's counting the art as pages - I'll see when I see my final report on INEBG. This blog is basically for keeping track of update progress. I checked my sites once with Link Alarm - except I did a general one from the main Mystic Manor link. I fixed a couple of links on the Manor site, then fixed the links on Luciano's art page. Now I'm re-running Link Alarm - except this time, I've set it to separately check Mystic Manor, Fangirl Ravings, and It's Not Easy Being Green. I'll say one thing - it catches EVERYTHING. I found a link that had actually been left in from a page conversion that wasn't showing up on the visable page.